Reuter Organ Company's Op. 196 dates from the closing years of what is known as the Orchestral Organ era of American Organ building during which organs served an all-purpose function, providing music in churches, major exposition centers (such as St. Louis, San Diego, and San Francisco), department stores (such as the Wanamaker stores in New York and Philadephia), hotel ballrooms, civic auditoriums (Portland, Maine and Cleveland, Ohio), high schools, colleges, Masonic Lodges, and homes of the rich and famous (such as Longwood Gardens). Noted historian Orpha Ochse, in her book The History of the Organ in the United States, notes that these organs played, "orchestral music, popular favorites, patriotic songs, accompaniment for choruses, and background music." In order to function under these diverse repertoire requirements, organ builders viewed the organ more and more as a substitute for the orchestra. Organs built in the orchestral style possessed an wealth of 8' manual pitch that provided a diverse coloring of both flue and reed unison tone. Often the entire organ was under expression to allow maximum dynamic shading and control. 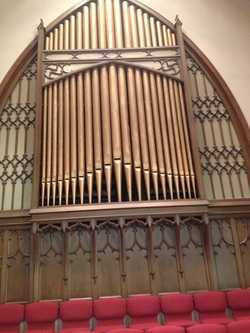 The organ at First United Methodist Church, although relatively small in size, allows one to travel back nearly ninety years in time to hear how the typical American church organ sounded. While the organ no longer contains the full pipework that occupied its 68- and 73-note windchests, the remaining pipework is original to the instrument. The current console was installed by the Reuter Organ Company in the 1970s.